Effort Sisyphus: Tech's post on global warming. Tech's post on global warming. But before I get to that, please bear with me. I'll get back to it in the next post. No blog is complete without it's mention of global warming. I'm not going to bother linking the thousands of sites that discuss global warming. Clearly the Earth is heating. I don't think this is disputed any more. The dispute is about whether or not people are causing that by dumping CO2 into the atmosphere or if our CO2 dumping is just a drop in the ocean in terms of atmospheric content. There is plenty of data out there to describe this pro and con. To sum up the 'other side'..here is a nice video. [EDIT: this link is dead now, it seems that The Great Global Warming Video is no longer viewable for free] It nicely summarizes all the aspects of the naysayers. The science is only 38 minutes of the entire video. The rest of it is nonsense about conspiracy theories about funding and a truly offensive implication that GW advocates are causing strife in Africa, which I just have to answer like this: Please show me a single bill from any 1st world nation requiring African Nations to get energy from renewable resources instead of fossil fuels. Secondly, the reason a clinic in the bush has a solar panel is because its incredibly expensive to run a power line out to it. If they don't have enough power with that panel, it is still cheaper to get another panel than to run a power line out to it. The implication in this movie is truly sinister. One more dumb thing in the video. they try to connect Temperature with economy. No climatologist says economy causes GW, its CO2, and there has never been a drop in CO2 production in 150 years. Adding a tiny bit extra (not defined) of anthropomorphic CO2 to the natural sources is not significant. Natural sources being the ocean, permafrost, volcanoes and cow farts. OK, Nay Sayers have I got that right? These are the same points brought up 10-20 years ago and are truly unchanged and tired. They were excellent points back then. However anyone still using these points are sadly and terribly not up to date with their data. I am on the side that humans cause global warming. Here is why. Lets start with why CO2 has lagged temperature in the past. The earth gets heated by a variety of cosmic events, solar cycles, cosmic rays, cow farts or whatever. These are natural forcing functions and have always been there and will always be there. some are cyclical some are not. For the past 650,000 years (unless you are a bible thumper in which case its for the past 6000 years), the earth has heated due to these forcing functions. This heating releases CO2 from the ocean and other CO2 sinks. So... the question is: where is the lag now? It is critical to note that there is no lag between CO2 levels and earths average temperature any more. If fact, for the first time in the history of the human species, CO2 is now leading temperature rise. Second question: If CO2 does not effect the temperature, why does the earth cool slower when the CO2 concentration is higher after the forcing function is gone? Fourth question: why don't you know that the previous satellite data was wrong and the newest data actually shows that the CO2-GW theory is actually supported by satellite data (because the troposphere is actually heating, while the stratosphere is cooling)? 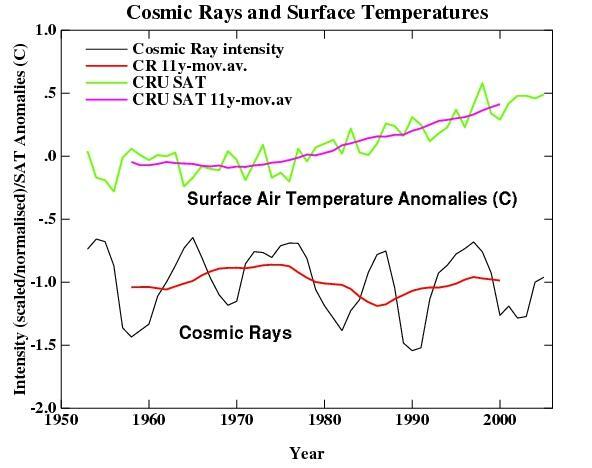 Fifth Question: For as long as we have been measuring cosmic rays, why has there been no correlation between them and earths temperature? Sixth Question: if sun cycles are causing our current heating why is there no correlation between the sun cycles and the earth temperature and why is the earth heating when the solar input is currently decreasing? Last question: If human activity adds so little CO2 to the natural sources (actually the amount is an extra 5%), why are the current CO2 levels higher than at any time in history even though the earths temperature is not as high as it has ever been? Further, and to me the most important. At no time in the history of earth has the temperature risen as quickly as it has in the last few decades. It is not really scary that the average temperature of the globe is hotter than it has been since we have been recording temperature. The earth has been this hot lots of times. The scary part is that it has never risen this fast. So in all the cycles, cosmic rays, sun spots and whatever other theories that right wingnuts want to put out there, there is no getting around the fact that this rate of temperature rise has never been seen before. And finally, you cant expect to dump 14 000 000 000 pounds of CO2 into the atmosphere every single year and not expect some sort of negative response. Of course the GHG theory explains all the data that is inconsistent with the movie. One more quick note on water. Yes it is true it is a green house gas. however the atmosphere is 99.99% saturated naturally with it. Human beings literally can not add to this amount of water in the atmosphere even if we burned all the fossil fuel on the planet. However, we easily can add to the CO2 in the atmosphere (and we have). Further, this saturation has always been there, it doesn't explain atmospheric temperature shifts. However, not all greenhouse gases are the same. CO2 absorbs light at a different wavelength than water does. So by changing the amount of CO2 in the air, we are actually absorbing a different set of wavelengths than water alone. Its important because its the same set of wavelengths that radiate off the earth when the light hits it an heats. These things lead me to believe that CO2 is causing the current temperature rise. Think of this: If I put a wire in a box filled with something thermally conductive, lets say water, the heating elements will rise to some temperature X, perhaps a few degrees. but if I change the media around the wire to something far more insulating like air, the wire will heat to potentially thousands of degrees! The element in a 20 watt bulb is thousands of degrees not because 20 watts is a lot, but because the vacuum it is in is a great insulator. We have added 37% more CO2 insulation to our atmosphere in the last 150 years. This is not disputable. 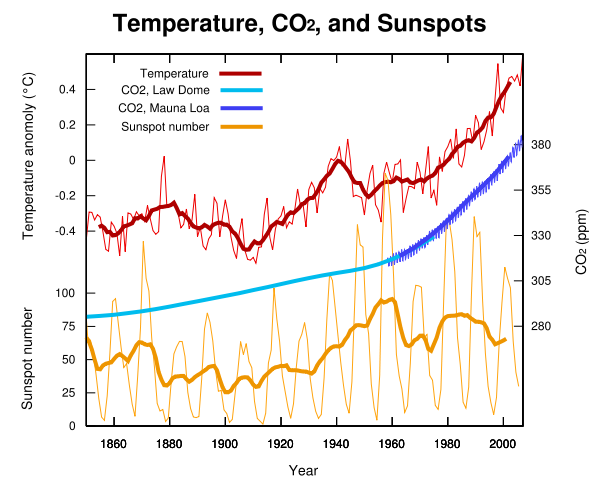 There does not need to be a change in the heat input to make the global temperature rise. Any changes in the heat inputs (say a solar cycles) will be exaggerated (in the hotter direction) due to the increased insulation. There is tons more data out there about how CO2 and other GHGs are warming the earth. Most of the nay sayers arguments have been put to rest (cosmic rays causing clouding, solar activity, troposphere temperatures, etc etc). Don't bother posting these tired 'alternate theories' in the comments (if anyone reads this at all). Here is a nice little remark on the outdated information in the video. Its sad that the naysayers have to keep their data restricted to before 1980, in order for it to be cohesive. Here is another point by point argument against the movie. And here is another nice rebuttal. I came here because you linked to this on the Skeptico blog saying this was your evidence. I get here and where is the evidence. You lied. But then I knew you were lying. "Further, and to me the most important. At no time in the history of earth has the temperature risen as quickly as it has in the last few decades." What a ridiculous lie. Glacial periods end very quickly and the temperature goes up very fast when that happens. After they younger dryas period also, once the Gulf Stream started up the temperature went up very quickly. So you come here and ignore links and spout off the same nonsense you spouted at skepticos. If you next coment doesnt have links to back up your claims, or you continue to just blather on without adderssing specific items in the post, you will be banned here too. You don't have any evidence. You lied. You tell me your evidence IN YOUR OWN WORDS. The fact is you lied. "One more quick note on water. Yes it is true it is a green house gas. however the atmosphere is 99.99% saturated naturally with it." This is just ridiculous. Its one thing after another. The Sahara isn't 99.9% saturated. Antarctica and the middle of Western Australia isn't either. Its hard to know what the hell you are on about on this score. Its like Mark Twains King Arthur talking about the best potato's growing only on the highest branches. Wow, again the no links to back up a single thing you say. Last warning. So what? Do your own homework and this time get it right. You don't know what you are talking about. Everything you say is wrong. You claim that we have more CO2 insulation than before? Not even the fraud Al Gore would say such a thing. We are thought to have a CO2 level 37% higher. Not 37% more insulation. CO2 is not a better insulator than normal air anyway. The thing which is thought to increase is backradiation. And not by the same as the CO2 level has risen. They claim its a logarithmic relationship. Not a linear one. Now you've just got to stop talking idiocy fella. Anyone who claims that anything I have said here is not true is ignorant or a liar. If you wish to find something out ask questions. Since it appears you are totally unfamiliar with the material. Where is your evidence? And what is the specific hypothesis you think this evidence supports? Data is not evidence unless marshalled for a specific hypothesis. It looks like you've just gone to Coby Becks place and bought into his pathetic excuses for not having any evidence. Alright good bye. I support every claim I make with links above. Your pathetic attempts at arguments from ignorance and arguments from personal authority will not work here. Go find someone else pester. TechSkeptic, I came here following links from the Hyperion power module sites. I appreciate your conversation with Rod Adams about solar vs micronuke. As someone who will benefit financially from our new solar technology, I can't help but recognize the superiority of 24/7 power on-demand that nukes provide (even with battery back-up, solar can't compete). As to AGW, my first inclination, as a doctor with at least a modicum of science background, is to question the negative effect of increased atmospheric CO2. Every breathing entity - on land and in water - exhales CO2. Every plant uses CO2 to grow and "exhales" O2. To think that mankind can exert some effect on this is puzzling, at best, IMHO. As to AGW "skeptics", do you think Dr. Richard Lindzen and Dr. Roy Spencer are wrong and, if so, how? Some AGW proponents have said the "debate is over". When, where and between whom was this "debate" conducted and where can I find the transcript? Rather than resort to sophomoric name-calling (i.e. "deniers" - as if we're the equivalent to Holocaust deniers), can we honestly engage in an adult conversation? do you think Dr. Richard Lindzen and Dr. Roy Spencer are wrong the answer is yes. Just look at Geamebird above, I present tons of evidence, not even high level evidence, and he ends up with "So? No evidence?" I have no idea if you are a AGW denier or not. We can discuss, but I'd rather do it by email, only because its more efficient. I'd happily summarize our conversation in a blog post (and you could too if you have a blog or can comment if I was fair or not in my comments). Hi, i'm really interested in this post...I want to know more about "Tech's post on global warming.". At no time in the history of earth has the temperature risen as quickly as it has in the last few decades." hello friend amazing and very interesting blog about Tech's post on global warming. Hey, i just wanted to say that you raise a lot of good points here. This subject is very controversial and everyone will have a deferent opinion about it. wow. lastly, I found something helpful for my paper to write about. this is attention-grabbing and helps me with more research within the future. Glad I found this blog.Thank you. And I do hope you'll develop some of your ideas about this subject and I will positive come back and read it. Thanks for the hassle and time. I've been looking out good details about this matter for some time and I gotta say you put up offers me some general idea about my paper I am gonna write for my assignment. I would really like copy a few of your phrases right here and I hope you do not mind. Thanks. I'll reference your work of course. Thank you.Preserve updating the nice posts. will come back.